GREEN BAY, Wisc. – Ryan Downard is two months into his new job as a defensive quality control coach for the Green Bay Packers, a position typically known around the NFL for long hours and low pay but also for one other important thing. A quality control job can be a first step toward bigger and better things in the pro football coaching world. NFL head coaches like Oakland’s Jon Gruden, Green Bay’s Mike McCarthy and San Francisco’s Kyle Shanahan got their starts in quality control. Several of McCarthy’s current assistants paid their dues in quality control jobs, breaking down film, analyzing opponents and peering into computer screens to draw playbooks and game plans. 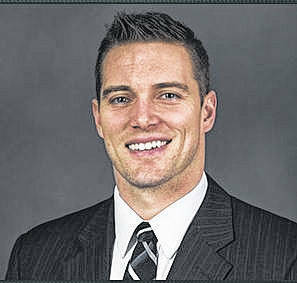 The 2006 Shawnee High School graduate was safeties coach at Bowling Green State University last season and director of football operations there in 2016. He also was a graduate assistant at Toledo and Texas Tech after playing football at Eastern Michigan, where he had nine career interceptions. “I’ve always been an NFL guy. As a little kid I grew up loving the NFL. Not that I didn’t like college football. I just realized how much I love the NFL,” he said. Working in an entry level position as a coaching assistant on the Cleveland Browns staff in 2014 and 2015 when Mike Pettine was their head coach played a significant role in Downard’s move to Green Bay. When Pettine was hired as the Packers’ defensive coordinator in early January he wanted Downard as part of his staff. “I’ve had a relationship with Coach Pettine,” Downard said. “He was still in the area, still in Ohio, and my wife and kids and I had gotten close to them. Any chance I could get to have a conversation with him, or visit with him or go up and stay the night and pick his brain and just listen, I took him up on it. “He is extremely smart and he’s a great person. He has always been really good to us and our family. I stayed in touch with him. I used him and a lot of other coaches as resources when I was getting on my feet at BG,” Downard said. Downard said he has felt the aura around the tradition-rich Packers franchise since coming to Green Bay. Downard and his wife Julie, an All-Mid-American Conference soccer player at Eastern Michigan, appreciate the chance he has gotten. “We’re really appreciative of Coach McCarthy and Coach Pettine bringing us up here. Any time you have a chance to be in the NFL it’s awesome,” he said. But when it came to looking for a home for their family, which includes 2-year-old Jaxon and 8-month-old Camden, there was such a thing as being too close to the Packers. Lambeau Field sits in a residential neighborhood but they concentrated on areas a little farther away from there. “When we started looking for houses we were trying to get as close to the (Packers) facility as possible. We started getting into houses where they said, ‘Yeah, we rent parking places on game days.’ We steered away from that,” Downard said. Unlike college quality control positions, NFL quality control people are allowed to take part in the full range of coaching activities, including game day coaching if that is part of their assignment. “I haven’t been through a full year yet (in Green Bay) so I really don’t know all it’s going to entail,” Downard said.